All that glitters...This Asus model uses a Maxwell GPU from Nvidia and a Haswell Core i7 from Intel. A strong duo which is capable of running modern games. The laptop even boasts a Full HD panel and seems to be the optimal package. Is that really true? Let us find out in an in-depth review. 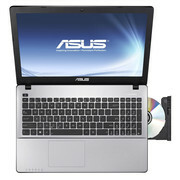 The Asus F550LN-CN89H is the 15.6-inch sibling of the X750LN-TY012H (Core i7-4500U, GeForce 840M). Both laptops utilize the same CPU and GPU. The X750LN impressed us as a good 17.3-inch all-rounder. We will see if the F550LN can match its bigger relative or even surpass it. We used the following models for comparison: Acer Aspire V5-561G (Core i5-4200U, Radeon R7 M265) and Lenovo IdeaPad Z510 (Core i5-4200M, GeForce GT 740M). Despite a price tag of 800 Euros (~$1089), the buyer can only expect a synthetic material case. The top is colored a dark silver-gray and the bottom and display cover are held in black. 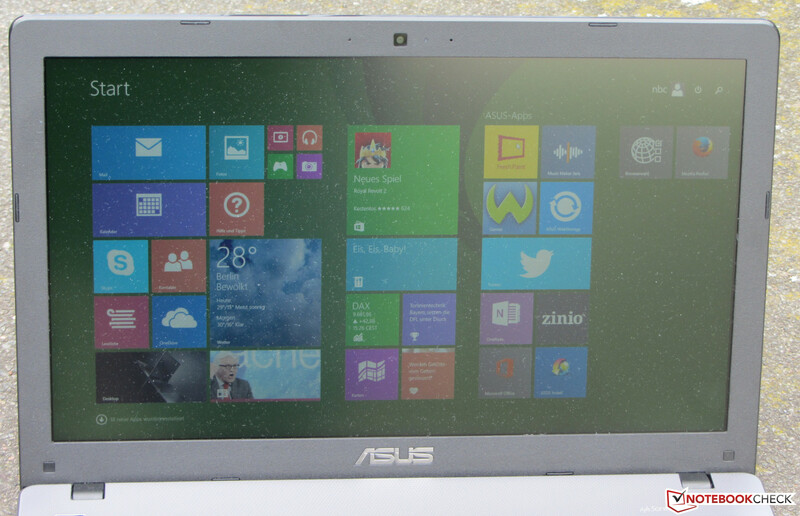 Asus uses textures: The display back is covered with concentric grooves with the center at the middle of the panel. The hand-rest regions have a fine grid structure. We really like the choice of not including any glossy surfaces. The F550LN is visually quite attractive. 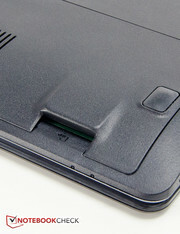 The case has the typical flaws: To the left of the keyboard and below the touchpad, the material can easily be deformed. 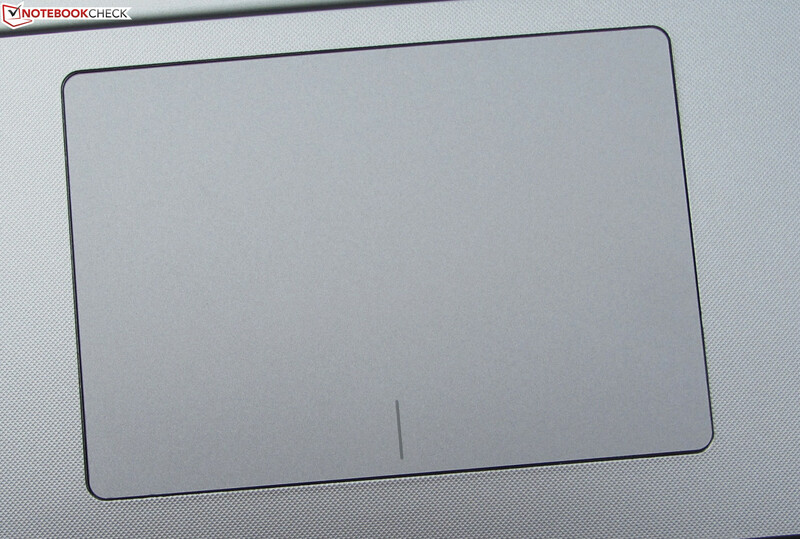 The display cover is also a bit weak, which means pressure on the back can deform the panel output. The hinges hold the panel strongly but allow it to wobble a little. It is possible to open the panel with a single hand, if it is opened slowly. 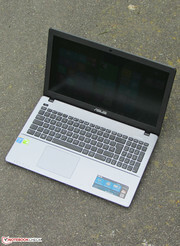 The Asus F550LN (photo from Asus). 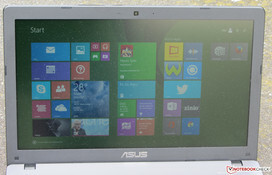 Asus uses a textured display cover (photo from Asus). A maintenance flap is provided. None of the three models we are comparing in this review have any special connectivity to offer. The IdeaPad trumps the others with a Fast-Ethernet port, whereas the two other models offer Gigabit Ethernet. The connectivity of the F550LN is not ideal. Most ports are placed on the left side, with the exception of a single USB port on the right side. 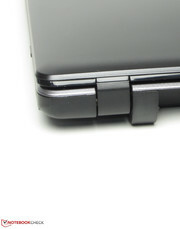 The memory card reader is placed on the front. 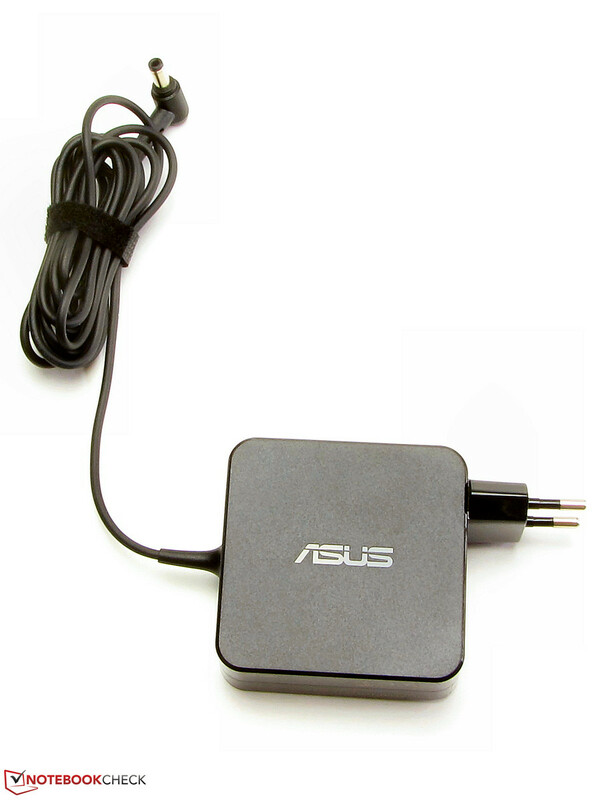 The Asus F550LN uses an AR9485 chip from Atheros for its WLAN module. It supports the WLAN standards 802.11 b/g/n. We did not observe any issues with the WLAN connectivity. We tested at multiple distances (at 3 meters away from the router and two floors below it). The router was set to 50% performance. There were no disruptions in the WLAN connection. The Gigabit-Ethernet chip of the RTL8168/8111 from Realtek allows the user to connect to the Internet with a LAN cable. The webcam offers a blurry picture at a resolution of 1280x720 pixels. 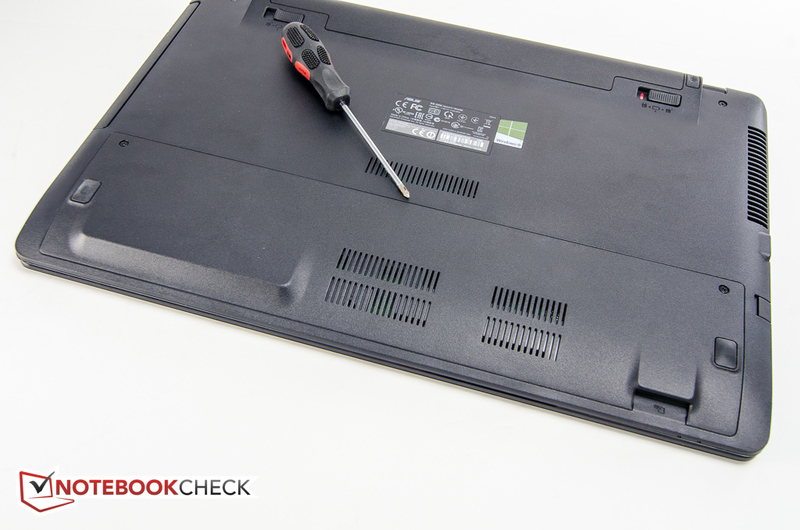 The notebook has the typical accessories: a quick-start guide and warranty information. The F550LN is delivered with Windows 8.1 (64-bit) preinstalled. A Windows DVD is not included. 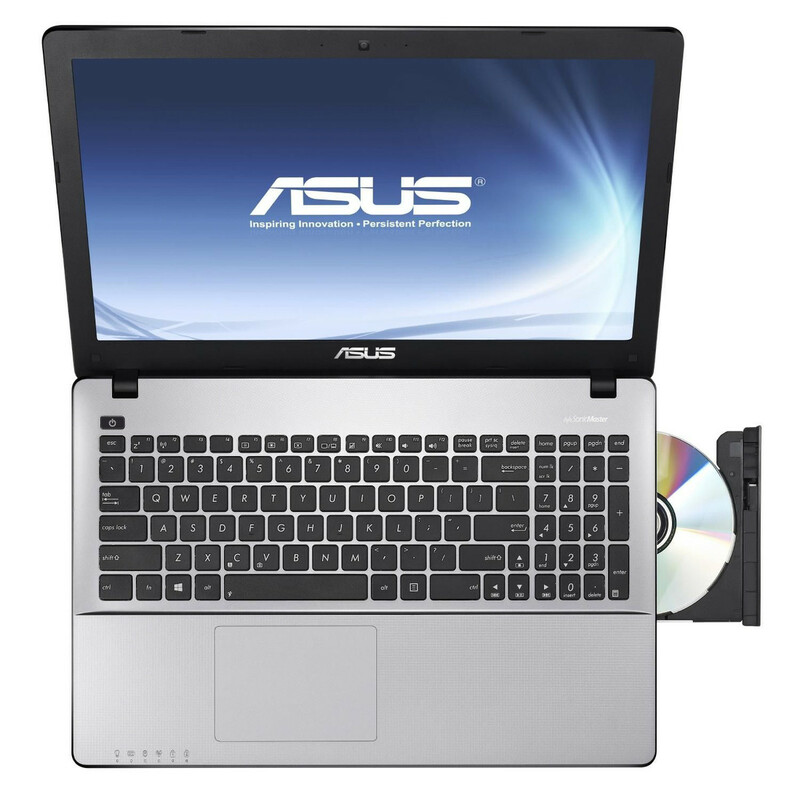 If you wish to install Windows 7, you will have to first find all the necessary drivers as Asus only provides drivers for version 8.1. A maintenance flap on the bottom of the model provides the user access to the HDD and RAM. The F550LN has a single RAM slot, which is occupied by a 4 GB module. Another 4 GB of RAM is soldered directly onto the motherboard. 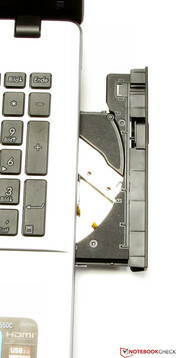 The HDD can be swapped out with 2.5-inch models with a height of 7 or 9.5 mm. 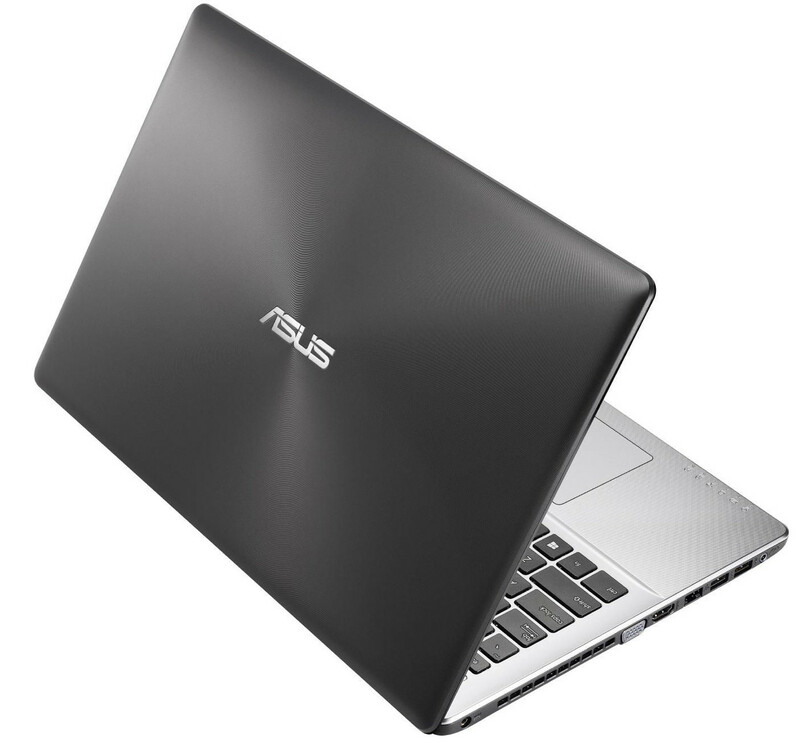 Asus offers a 2-year warranty for our test model. The same is true for the Aspire and the IdeaPad. Extending the warranty is possible: up to three years for 80 Euros (~$108) more. 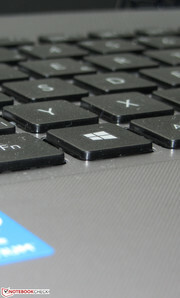 The F550LN is equipped with a chiclet keyboard (not backlit). The flat, slightly roughened keys have a medium stroke distance and a clear pressure point. 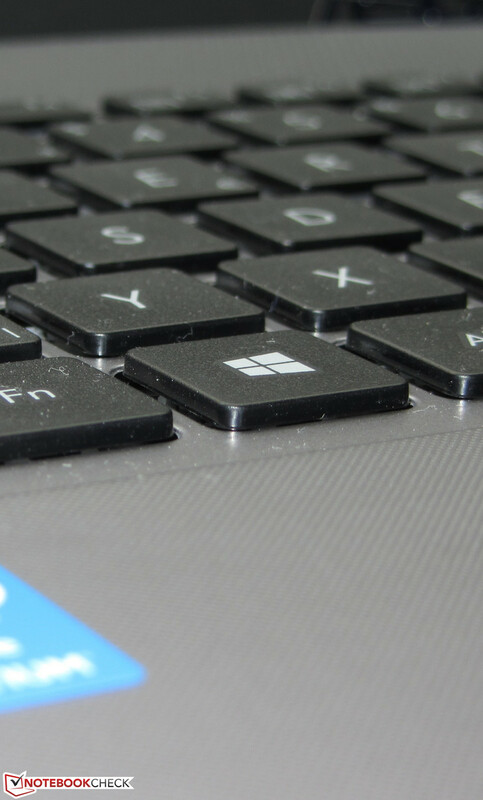 The key resistance should be a little stronger and the keyboard gives way a little when typing (more near the middle than at the edges). Overall, the keyboard is good for typical use. Typists may want to consider other models. 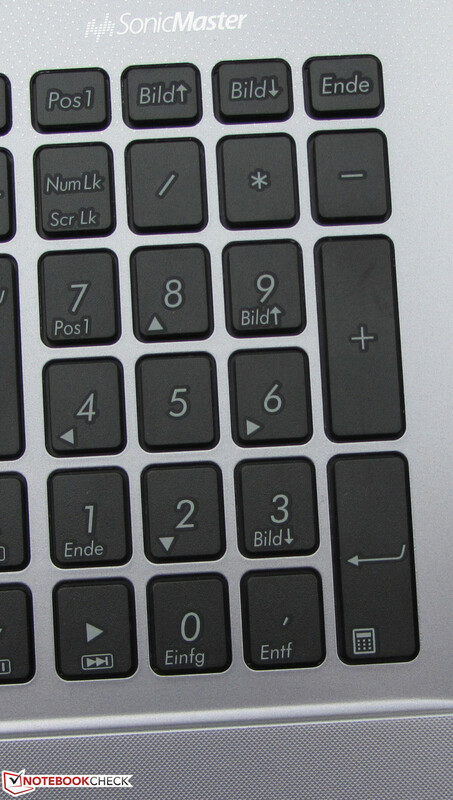 The mouse replacement is provided in the form of a multi-touch ClickPad (a touchpad with no separate mouse keys). 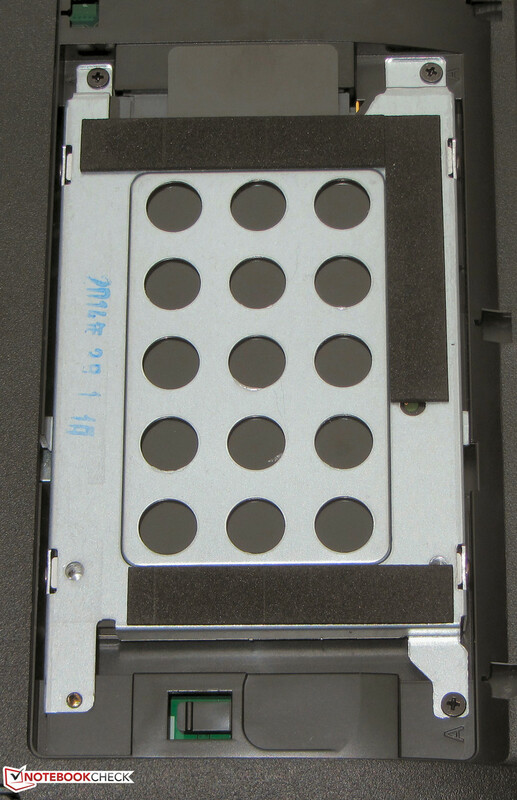 The surface of the device measures 10.5 x 7.3 cm. 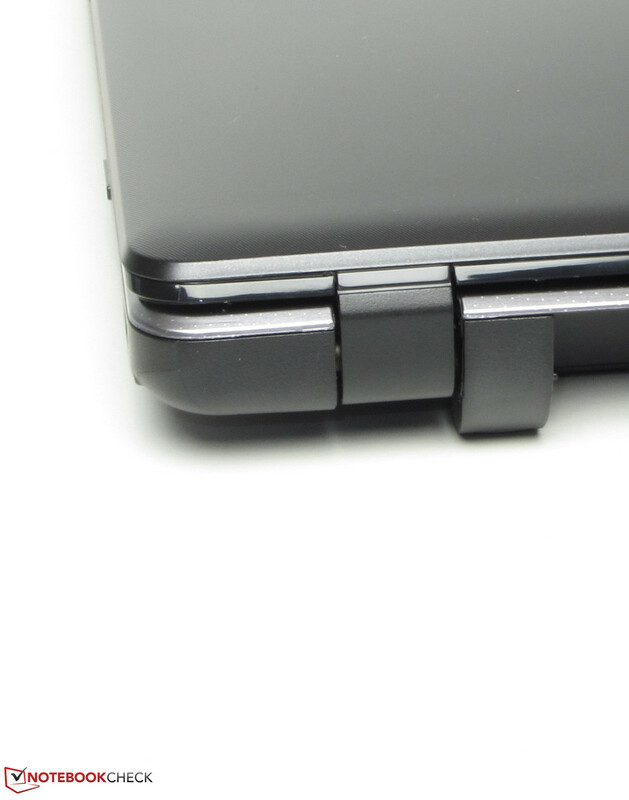 The smooth surface of the pad allows the finger to glide over it. 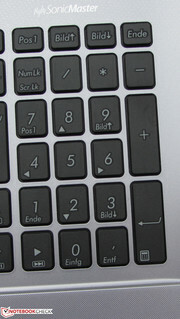 Various multi-touch gestures can be used on the pad, and these can be configured and turned on/off in the mouse settings. The buttons have a short stroke distance and produce an audible clicking noise. Asus has chosen a matte 15.6-inch panel which has a native resolution of 1920x1080 pixels. Sadly, the model in our laptop is quite dark. We measure a mere 166.4 cd/m² for the brightness, which is not appropriate for this price class. Normally, the buyer should expect at least 250 cd/m² at this price range. 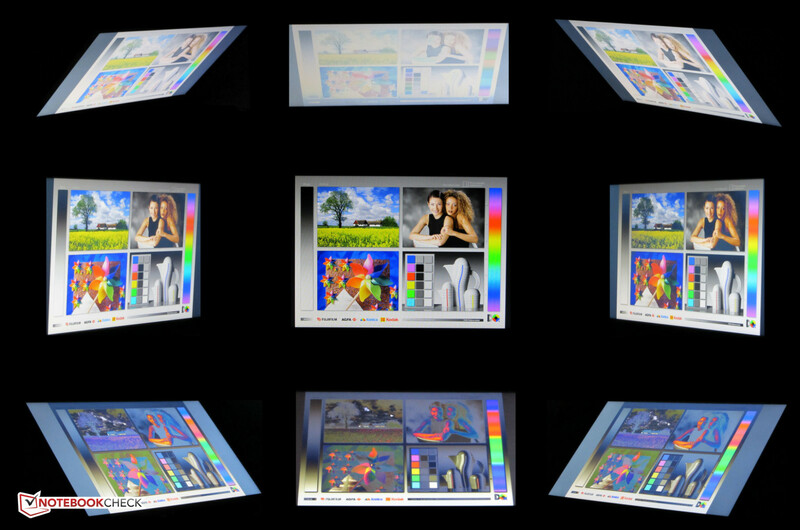 Far brighter displays are available in the Aspire (280.4 cd/m²; Full HD) and the IdeaPad (294.6 cd/m²; Full HD). The contrast (434:1) and black value (0.41 cd/m²) of the panel should also be better. 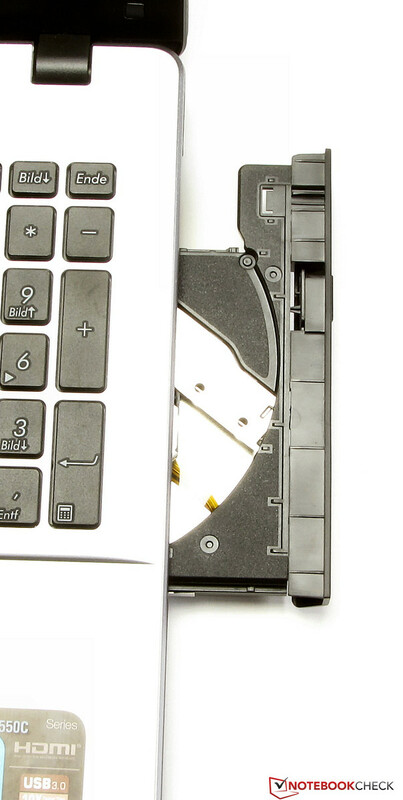 The IdeaPad (327:1, 0.97 cd/m²) performs worse but the Aspire takes the tail end (236:1, 1.27 cd/m²). The AdobeRGB and sRGB color spectrums can not be covered by the F550LN. We measure 56% (sRGB) and 39% (AdobeRGB) coverage. 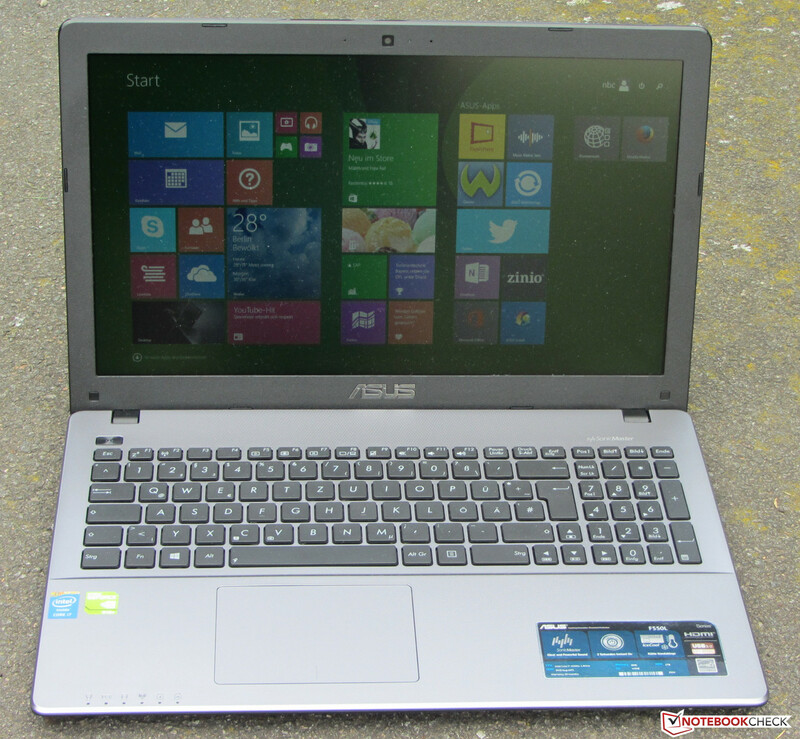 Asus configures the color schemes for a few notebooks: the test model is one of these. This allows the F550LN to provide good colors right out of the box. The average DeltaE 2000 deviation of the panel measures 4.36. The ideal spectrum (DeltaE value smaller than 3) is just a little out of reach. The panel has a slight blue tinge when the pre-configured color scheme is removed. Thanks to the matte panel, the laptop would be an ideal candidate for outdoors use, were it not for the low brightness. We recommend staying away from very bright surroundings. It appears Asus has chosen a simple TN panel for its model due to its price tag of 800 Euros (~$1089). This means that the viewing-angle stability is poor and can be compared to that of cheap models. A change in the vertical viewing angle results in strong distortions in the picture. The horizontal viewing angle is more stable and thanks to this, multiple people can look at the screen simultaneously. 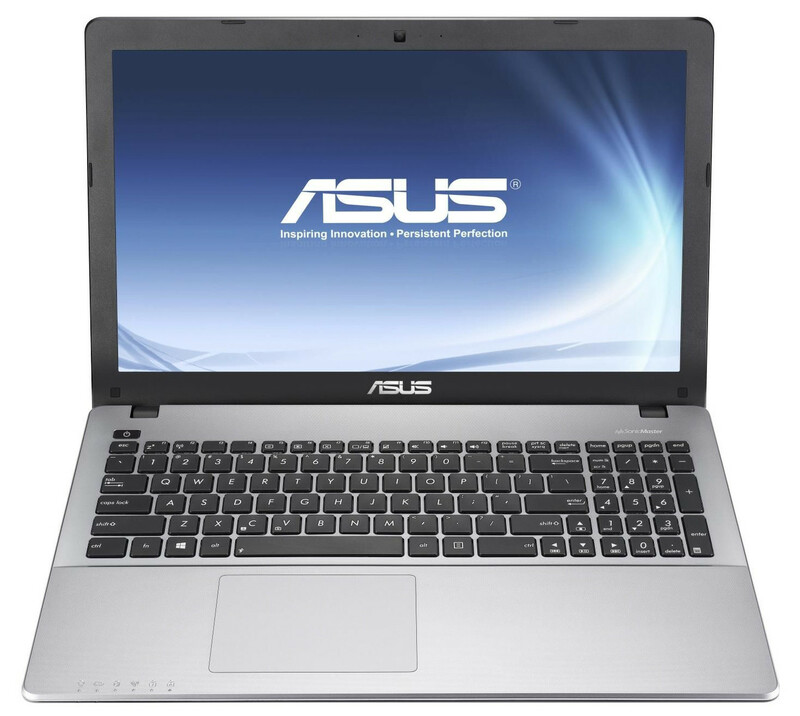 The Asus F550LN-CN89H is a 15.6-inch all-rounder: The Core i7 CPU and GeForce graphics card allow the user to run modern games. 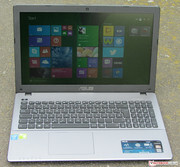 The test model offers quite a lot of performance for 800 Euros (~$1089). For the F550/X550 series, the manufacturer offers various configurations. The F550LN is equipped with a dual-core Core i7-4500U. This is based on the Intel Haswell architecture and operates at a base clock speed of 1.8 GHz. Turbo allows the processor to boost the speed up to 2.7 GHz (both cores) and 3 GHz (single core). The CPU is one of the more conservative ones as it has a TDP value of 15 W.
The CPU tests of Cinebench reveal that the CPU runs at max speed at all times. As such, the performance matches our expectations. The IdeaPad offers better results, but the gap between it and the F550LN is a small one at best. The IdeaPad benefits from a faster base-clock speed. A strong processor, a powerful GPU and a fast storage device ensure good system performance. We did not find any issues. The test model performs quite well in the PCMark benchmarks. The IdeaPad once again claims first place due to its hybrid storage device (HDD with a SSD cache) and stronger processor. Asus has chosen an HDD from the Seagate Momentus series for our test model. The capacity of the device is 1 TB. It operates at 5,400 rpm. As expected of Asus notebooks, the HDD is split into two partitions: operating system partition (372 GB) and storage partition (537 GB). CrystalDiskMark records a good read speed of 101.2 MB/s. HD Tune shows an average transfer rate of 82 MB/s. These are typical values for an HDD. The Intel HD Graphics 4400 GPU and the GeForce 840M graphics chip have found their place in the F550LN. The two chips have different responsibilities: the Intel IGP is responsible for everyday tasks (low performance required) whereas the GeForce GPU takes care of more demanding applications, like games or CAD. Both graphics chips support DirectX 11. The GeForce 840M core belongs to the latest Nvidia line-up: the Maxwell generation. The GPU places in the upper middle-class and has a base clock speed of 1,029 MHz. Turbo allows the speed to boost up to 1,124 MHz. The test model performs superior to the other models in the 3DMark benchmarks as it uses the strongest GPU. The Core i7 CPU and GeForce GPU allow the laptop to run most games fluidly at a HD resolution (1366x768 pixels) and medium to high settings. Games like FIFA 14 and Counter-Strike: GO run well even at the FHD resolution with max settings as they require relatively low performance. 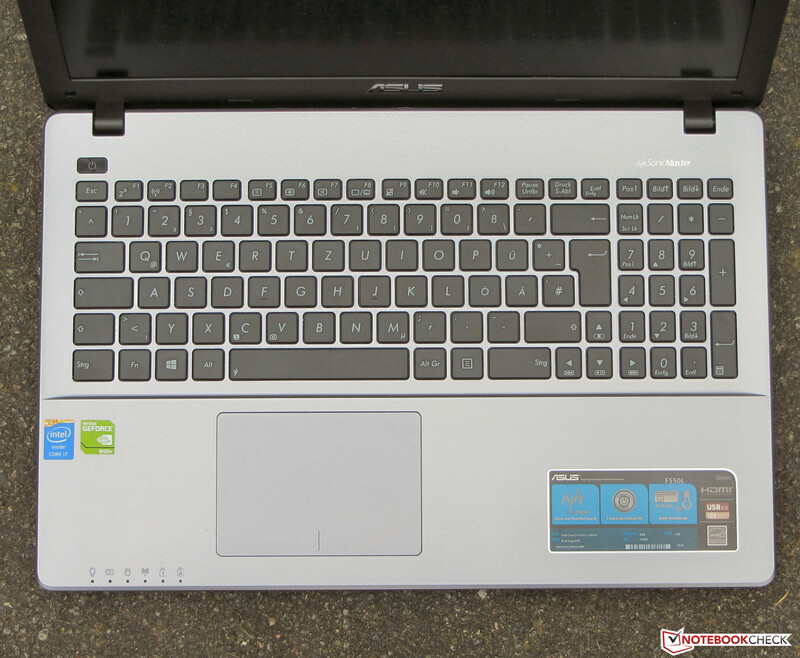 The IdeaPad is equipped with a GeForce 840M chip and clearly lags behind the F550LN. While idle, the test model is not audible. 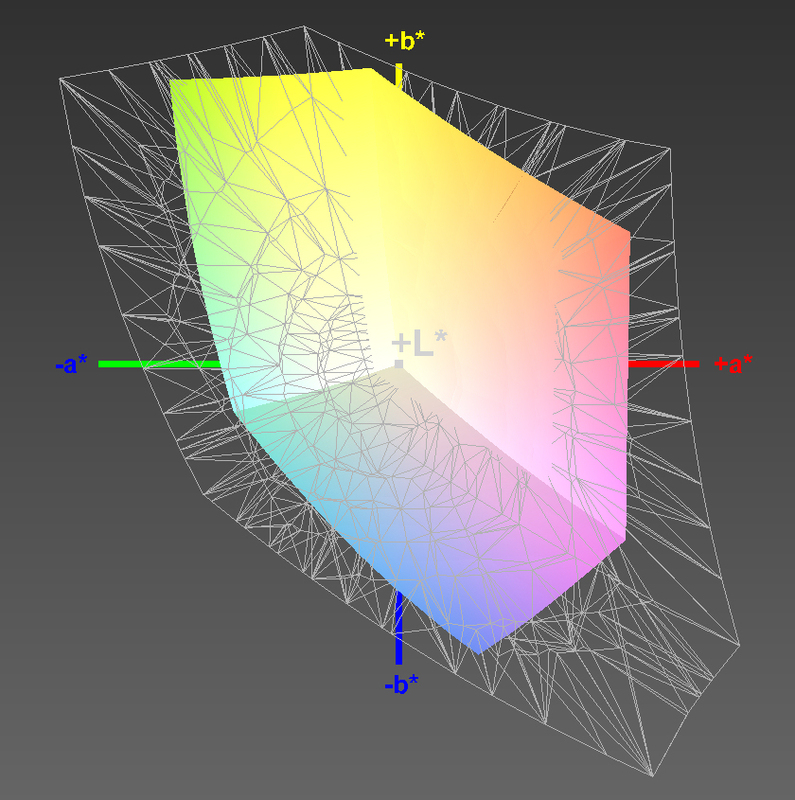 At medium load (3DMark06 running), the fan still stays quiet. 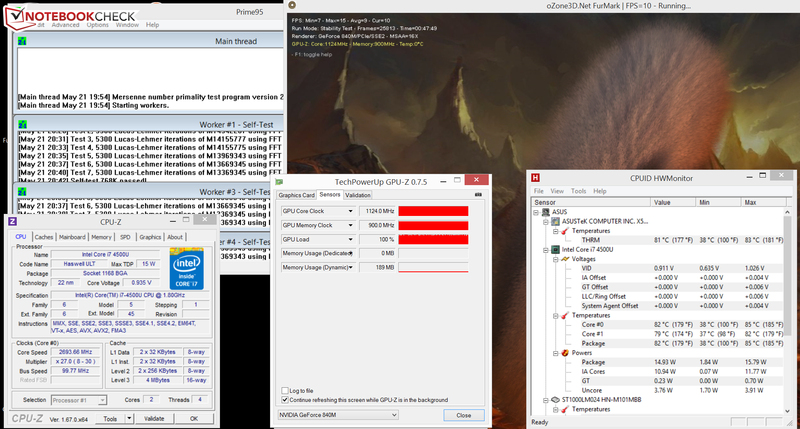 At full load (stress test; Prime95 and Furmark run for at least an hour), the fan has to turn up to max speed. We measure an emission of 41.1 dB. This value is fine as the laptop uses powerful hardware. The Aspire and the IdeaPad have similar emission levels. All models stay relatively cool: while idle, temperatures are all in the green region. Even during the stress test, the models do not overheat. At most, they cross the 40 °C mark in some areas of their cases. Overall the test model stays the coolest. The stress test (Prime95 and Furmark run for at least an hour) is run by the GPU at max speed (while plugged in and while on battery). The CPU operates at 2.6 - 2.7 GHz while plugged in, but on battery it is throttled down to 800 MHz. The CPU temperature reached around 82 °C during the stress test. 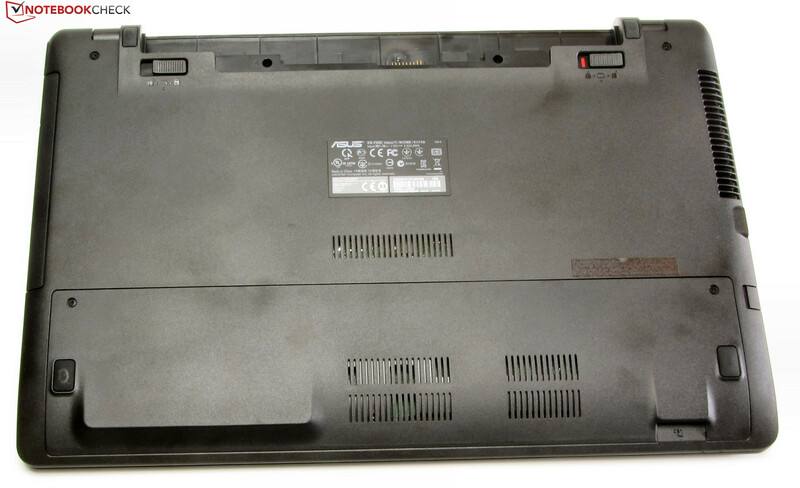 The stereo speakers of the F550LN are placed above the keyboard. There are no speaker openings, but the speakers still manage to produce a loud sound, lacking bass. Speech is recognizable. 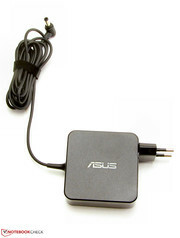 Overall, the Asus speakers perform well. 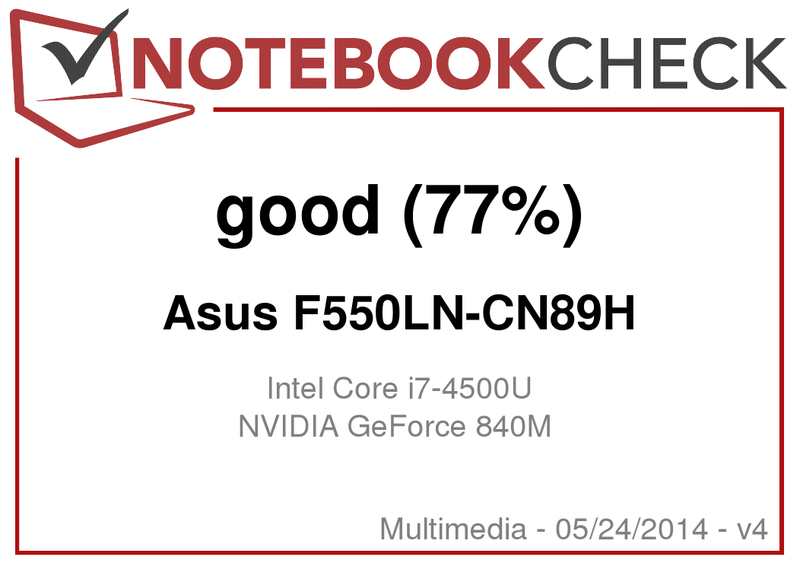 The Asus test model deserves praise for its low power consumption while idle. The power consumption stays under 10 W thanks to the ULV hardware. However, having ULV hardware by no means guarantees the low levels of consumption as shown by the Aspire. 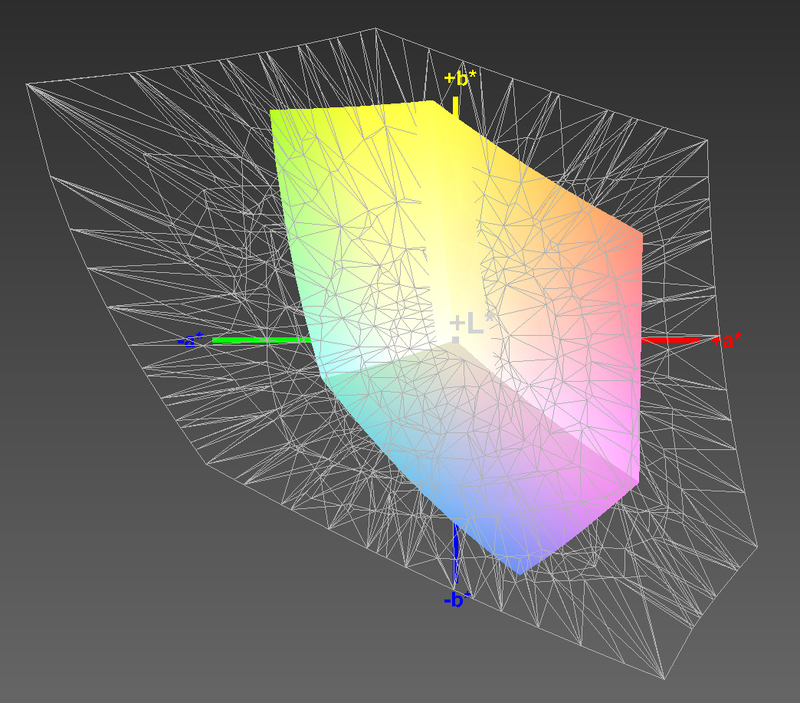 At medium load (3DMark06 running) the laptop is still quite conservative. However, at full load (stress test: Prime95 and Furmark run at least an hour), the laptop requires more power than the two other models. This is understandable as it is more powerful than them. While idle, the battery of the F550LN holds for 7:17 hours. The Aspire (6:58 h) and the IdeaPad (6:56 h) give up a little earlier. For this scenario, we used the Battery Eater Reader's test which sets the brightness to the lowest level, turns the Power-Saver profile on and all wireless modules off. At load, the F550LN is finished after 1:14 hours. This places it between the Aspire (1:06 h) and the IdeaPad (1:29 h). The runtime at load was measured using the Battery Eater Classic test. 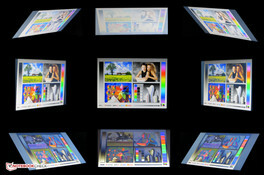 The panel uses full brightness, High-Performance profile and all wireless modules are turned on. The WLAN test is finished after 3:50 hours. The Aspire (3:32 h) and the IdeaPad (3:27 h) give up earlier. This test loads websites every 40 seconds with the Power-Saver profile and brightness set to 150 cd/m². DVD playback is finished after 3:04 hours, once again placing our test model ahead of the Aspire (2:10 h) and the IdeaPad (2:43 h). The DVD test is run with Power-Saver mode (or a stronger profile, if the DVD playback is not fluid), full brightness and wireless modules turned off. Overall, the battery life is good as this is a powerful laptop with a relatively small battery (Asus: 37 Wh, Acer: 37 Wh, Lenovo: 48 Wh). 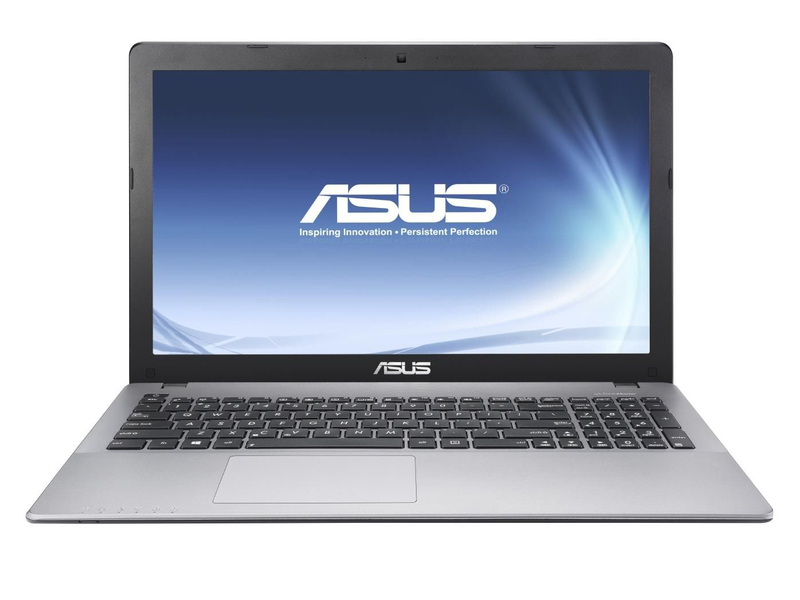 The Asus F550LN-CN89H has a lot to offer: good system performance and gaming performance. It has a lot of storage space and despite the powerful hardware it is usually quiet and heats up relatively little. The battery life is good and the decent input devices along with a two-year warranty round off the offer. The display is a major letdown, as despite having an FHD resolution, a matte surface and good colors, the poor viewing angles, low brightness and weak contrast make it unsightly. The advantages of the Acer Aspire V5-561G are in its brighter Full HD panel. Furthermore, it is cheaper than the F550LN by 100 Euros (~$136) but has weaker performance. The Lenovo IdeaPad Z510 uses a brighter FHD panel and is equipped with the strongest processor of the three. This model is available for 630 Euros (~$858) but without the Windows OS. The DVD burner reads and writes every type of DVD and CD. The keys have a medium stroke distance. 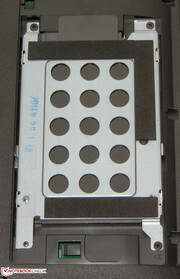 Two screws need to be removed to take off the maintenance flap. This provides access to the RAM and HDD. 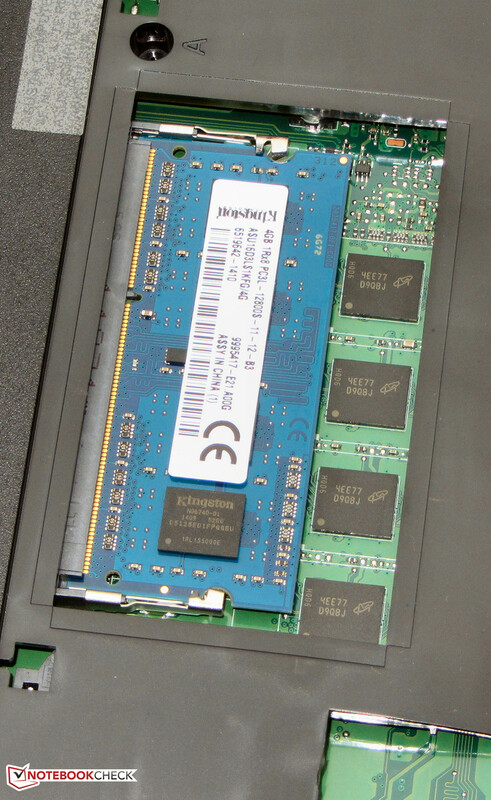 A RAM slot is available. Swapping the hard drive should not pose any problems. 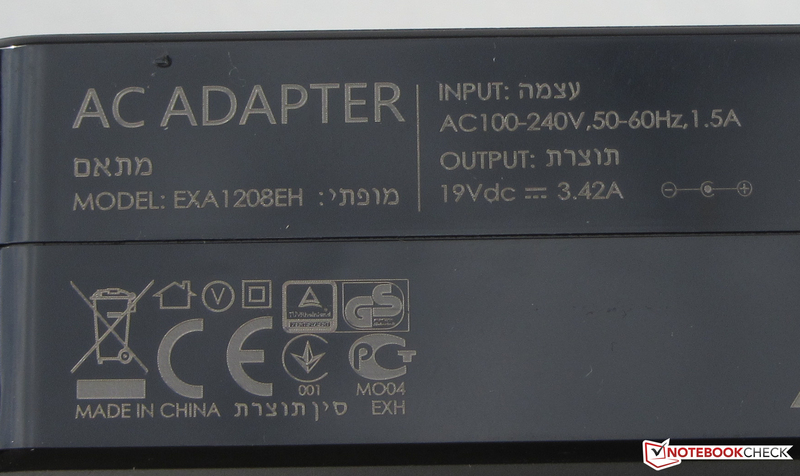 The power adapter weighs around 245 grams. The good system and gaming performance as well as the low emissions. A brighter display with strong contrast. 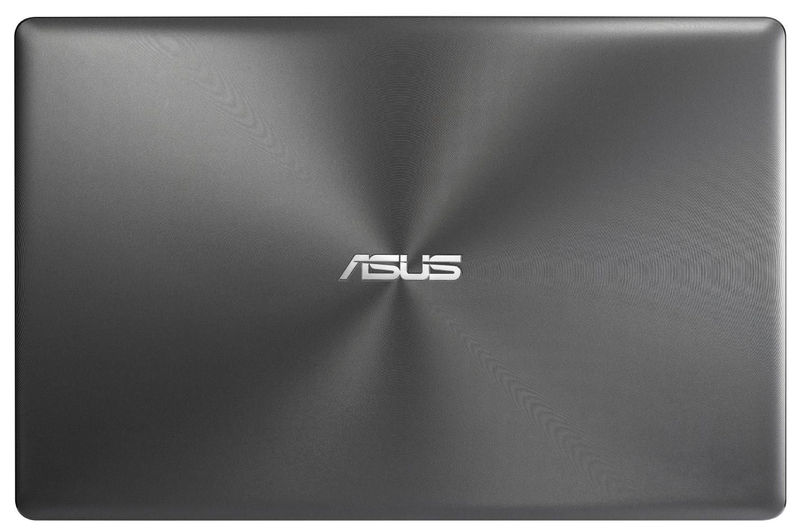 Asus has equipped the 800 Euros (~$1089) laptop with a very dark panel. Acer Aspire V5-561G, Lenovo IdeaPad Z510, Dell Inspiron 15R-5537, Asus N56JR-S4080H, Lenovo B5400, Acer Aspire V5-573G, Acer Aspire E1-572G, Asus X550LB-NH52, HP Compaq 15-a024sg, Lenovo ThinkPad Edge E540, Lenovo ThinkPad Edge E545.